The perfect gift for the person who has everything. A singularly unique opportunity to pay-it-forward. A genuinely infinite gift. These tributes not only honor the recipient, but are the catalysts that propel and perpetuate the legacy of love into future generations. This gift truly keeps on giving. In honor of Lisa Ricciuti (Feiertag's) marriage. To my mother who had a strong influence on my path in life and to whom I dedicate my work. I'm donating in honor of Reedy Hickey and her family, in gratitude for their twenty years of support to API! In honor of Martha Sears. In Honor of Kendra Godfrey for her birthday. To say that Mary Ann Cahill was an extraordinary woman is a total understatement. While working with her on the LLLI Board of Directors and afterwards with the LLLI Alumnae Association, I was constantly amazed by new facets and new depths to her . She served as Executive Director during a hard transition time, and stood up to the challenge with courage and compassion. She had the courage to write the book “The Heart Has Its Own Reasons” and stand up for principles and ideals that were not reinforced by our culture. Through the book she helped validate families all over the world, as they made “unpopular” but crucial decisions. Mary Ann’s heart of gold sustained me through many times as a mother and a woman. She helped me through family illnesses when I most needed the support. 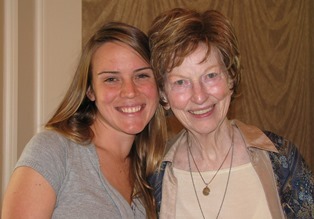 I loved her love of music and how much fun we had with Alumnae teas, Board skits and so many other priceless experiences! 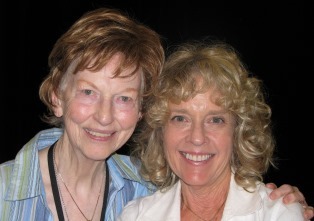 I was with Mary Ann at the 15th Anniversary of Attachment Parenting International, where she shared her experiences and passion for the ideals that API and LLL have in common. At the benefit concert we sat together to hear Vince Gill, Gary Nicholson and Beth Nielson Chapman perform with their adult children. I wrapped my arms around her and it was like hugging my own mother, who had recently passed away. It was, like many others with Mary Ann, a healing experience. I thank God for Mary Ann and the profound impact she had on so many people. Well done, good and faithful servant! two beautifully attached little souls, perfect illustrations of what comes from attachment parenting. Owen just created a beautiful website on "Peace," which he says is something very important to him. And Bennett's teacher calls him "the moral compass of the classroom," always making sure everyone is treated fairly and kindly. To Reedy Hickey from Janet Jendron: "With deep gratitude and admiration"
In Honor Of Tine Thevenin Bill and I are sending a donation dedicated to Tine - we love choosing a work that connects so beautifully with her message to families. Read author and API Board Member Martha Sears' full tribute and join her in remembering Tine through giving. In Honor Of Tine Thevenin When Lysa Parker and I started API in 1994, we began writing to our heroes and colleagues, asking for their support in the form of a letter of endorsement. I never thought that twenty years later I would have a letter from Tine in support of our efforts to continue with what she envisioned: happy families living in harmony and love. 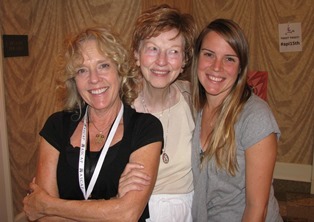 Read API Co-Founder Barbara Nicholson's full tribute and join her in remembering Tine through giving. In Honor Of Tine Thevenin It is an honor to donate to Attachment Parenting International in Tine's memory and in appreciation of the impact that she made on the world as a wife, mother, advocate, and wonderful human being. Read API President Janet Jendron's full tribute and join her in remembering Tine through giving. Congratulations to Janet on her new position as President of the Board of Directors of Attachment Parenting International! ~ Marian Tompson. In Honor of my friend Janet Jendron ~ Evelyn Evans. Janet loves all and serves all. Thanks for being a constant voice for attachment parenting. ~ From Timothy Conroy.